Tamilnadu 12th result 2015 out today. 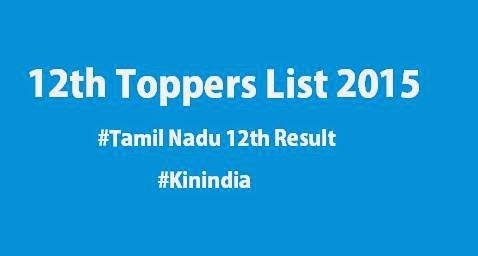 Kinindia very happy to post the 12th toppers list. Our Tamil Nadu students got good marks in annual public exam results. Though many scored high marks, only first 3 rank holders will be mentioned. Below we have given the plus two topper list along with their total marks, student name, school name and district. This is number of students passed overall and in each subjects. Total number of pass percentage in each subjects. Many number of students scored centum (100%) in each subject. Here given the total candidate secured full marks. District wise toppers list - pass percentage. It takes some time to update all the district, we will get the 12th result analysis and statistics which will be published as press release by TN state board.